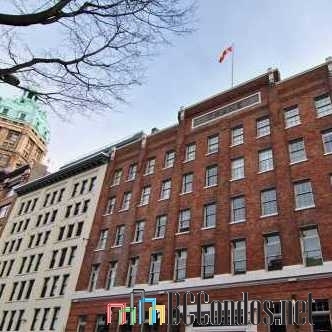 The Crane Building - 540 - 546 Beatty Street, Vancouver, BC V6B 2N7, BCS3240 - located in Downtown area of Vancouver West, near the crossroads Beatty Street and Dunsmuir Street. The Crane Building is walking distance to Simon Fraser University, London Drugs, Money Mart, Vancouver Film School, Victory Square, Army and Navy, Pigeon Park, Steamworks Vancouver, JJ Bean Coffee, Vancouver Community Centre, Starbucks Coffee, Harbour Square, Waves Coffee, Portside Park, Waterfront Skytrain Station, Canada Place, MTI Community College, Vancouver Convention Centre and Vancouver Harbour Water Airport. The restaurants in the neighbourhood are Meat and Bread, Wild Rice, Java Cat Cafe, Cassis Bistro, La Taqueria, Gorilla Food, La Casita and Old Spaghetti Factory. The bus stops near the building and Stadium-Chinatown Skytrain Station is only steps away. 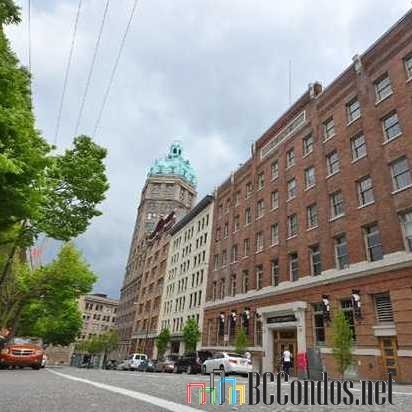 Downtown shopping and entertainment, Chinatown and Yaletown are minutes away. 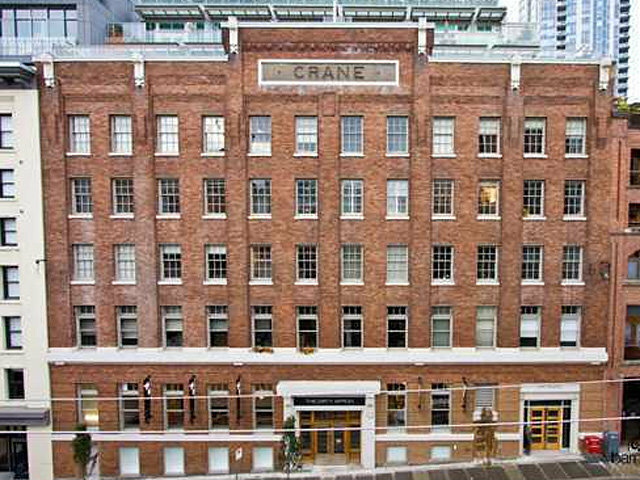 The Crane building was originally built in 1911 for the Chicago-based Crane Company. It served as the company's local offices and a showroom for their plumbing products. In 2008 Metroliving by the Townline Group converted the building into residential loft style apartments. This 7-level building has a concrete construction, concrete exterior finishing and full rain screen. There are 57 units in development and 59 units in strata. All the heritage elements, such as exposed brick walls, double sash windows, concrete floors and cast iron columns were retained by the developer. The building offers studio homes 620-686 sq. ft., 1 bedroom homes 632-789 sq. ft., 2 bedroom homes 993-1,133 sq. ft., 2 bedroom terrace homes 1,221-1,633 sq. ft., and 4 Penthouse homes with roof top decks 1,194-1,808 sq. ft. These character lofts feature an open plan concept, high ceilings up to 16', large windows, concrete features such as walls and polished floors, and exposed brick exterior walls. European inspired modular kitchens feature white high gloss laminate cabinetry, seamless glacier white Corian kitchen countertops, custom maple butcher block kitchen islands, white glass backsplash complete with a premium European appliance package. Spa-like bathrooms boast polished concrete floors, white high gloss cabinetry, glass mosaic accent wall tiles in the bathtub and shower, Carrerra marble countertops with rectangular undermount sinks by Liano. Sub-Penthouses and Penthouses boast private roof terraces/decks complete with fireplaces. Listings Listed By: 1. Stilhavn Real Estate Services 2. RE/MAX Crest Realty 3. 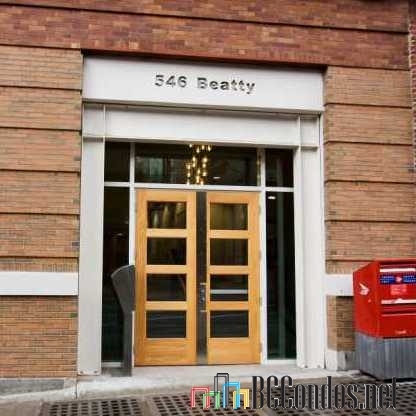 Rennie & Associates Realty Ltd.
408 546 BEATTY STR.. 1 Bed, 1 Bath,704 Sqft. $699,900 Rennie & Associates Realty Ltd.